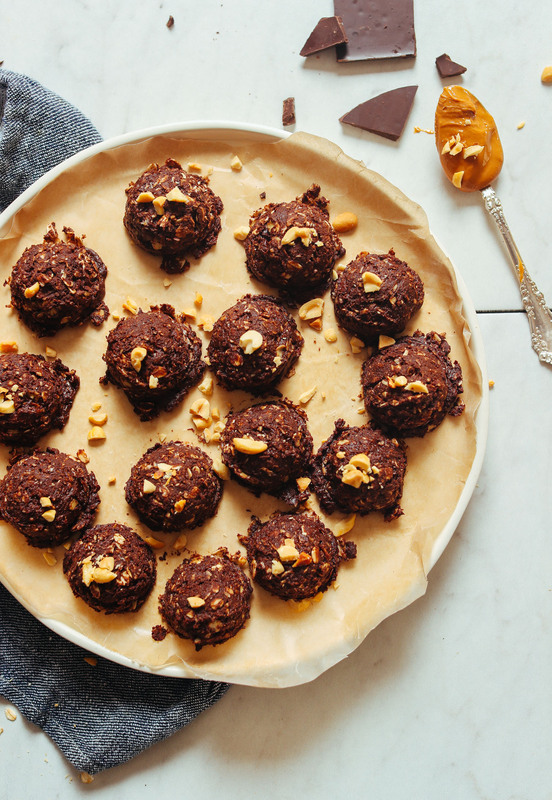 Behold: the no-bake cookie of my dreams. 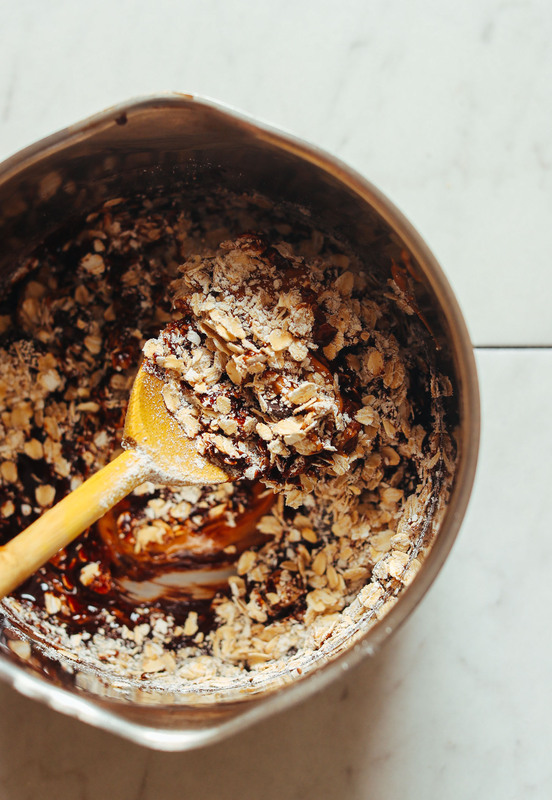 Peanut buttery, chocolatey, fudgy, and ready in 1 pot and 25 minutes! The base for this cookie is maple syrup, coconut oil, and cocoa powder, which are cooked down into a thick chocolate sauce. Then it’s time to add the vanilla, peanut butter, oats, and dark chocolate! 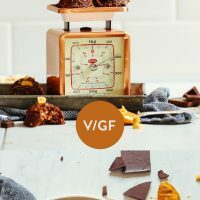 Dark chocolate not only helps these cookies set and harden, but also adds fudgy flavor and texture. To keep this recipe naturally-sweetened, simply use bittersweet or naturally-sweetened dark chocolate (such as Eating Evolved). Once your cookie dough is formed, scoop into cookies and let cool. The hardest part was not eating one (or three) while they were cooling. But be patient! They’re worth the wait. These cookies would make the perfect healthier treat to have on hand during the week. They would also be a great road trip snack! Personally, I prefer freezing a batching and pulling out one whenever a sweet craving strikes. For more cookie inspo, check out our Fudgy Vegan Brownie Cookies, Healthy Oatmeal Chocolate Chip Cookies, Almond Butter Chocolate Chip Cookies, Almond Meal Chocolate Chip Cookies, and Peanut Butter Cup Cookies! If you try this recipe, leave a comment, rating, and tag a photo #minimalistbaker on Instagram so we can see what you come up with. Cheers, friends! 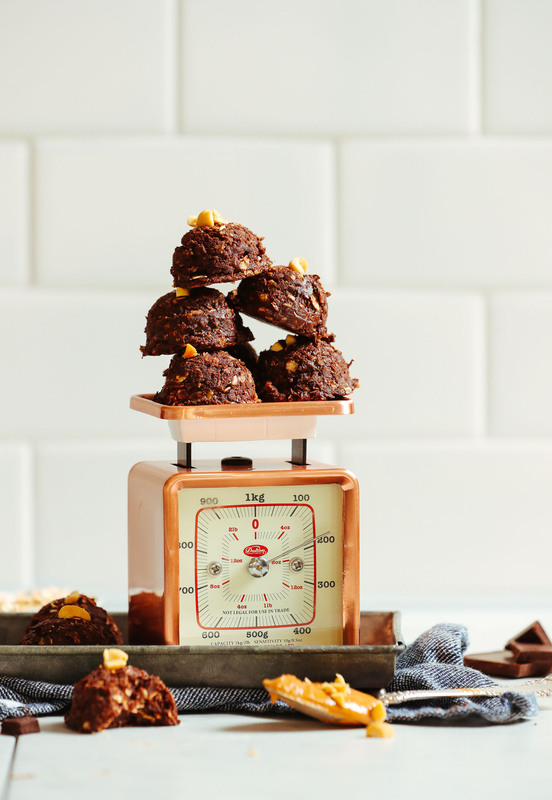 Fudgy, peanut buttery no-bake cookies naturally sweetened and fiber-rich from oats! Just 9 ingredients, 25 minutes, and 1 pot required! An indulgent and satisfying dessert. Line a baking sheet or serving platter with parchment or wax paper. Add maple syrup, almond milk, coconut oil, and cocoa powder to a medium saucepan and bring to a low boil over medium heat, stirring frequently. Once bubbling, let boil for 1 minute. 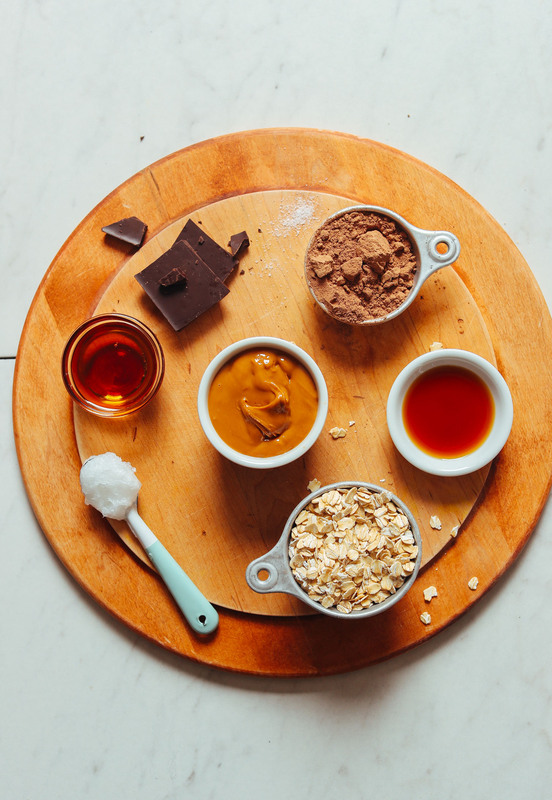 Then remove from heat and add oats, peanut butter, vanilla, salt, and dark chocolate and combine and fully incorporate all ingredients. Drop heaping Tablespoon amounts (I used this cookie scoop!) of the batter onto the prepared baking sheet or serving platter and sprinkle with crushed peanuts and/or additional flaked coconut (optional). Keep leftovers covered in the refrigerator for up to 5 days or in the freezer up to 1 month, though best when fresh. 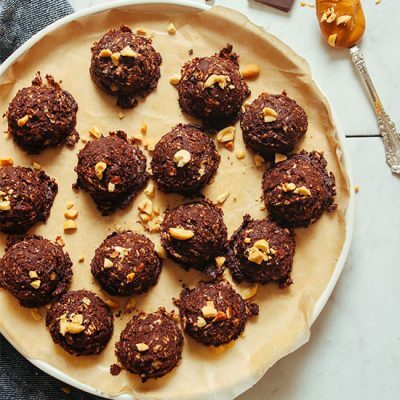 *To keep this recipe naturally-sweetened, simply use bittersweet or naturally-sweetened dark chocolate (such as Eating Evolved). Ha! I made these with my girls and *then* read the comments. I was going to say they were sweeter than I was expecting and perhaps a smidge too sweet—maybe because we used chocolate chips instead of the dark vegan chocolate. Funny that most everyone else thought they weren’t sweet enough. Either way, we had shredded coconut, chopped brazil nuts and roasted salted peanuts in the cupboard so we threw those in and they came out great. My co-workers brought these in to our Spring Fling party and they are just delicious. She passed the email on to the whole staff since they were such a nit. It is the favorite no-bake confection I’ve ever had. These do not have a strong peanut flavor, but are very, very chocolate-y and fudge-y (and yumm-y)! Thank you! This recipe is so easy and fast. I got my chocolate fix. Ahhhhh! So good. Eh, no, I’m going to change that to say I’ll try 2 tablespoons more maple syrup next time. 1/2 cup would probably be too much. And I’m changing the rating to 5 because these are really delicious and addictive, even if not quite as sweet as I was expecting. These are really good, but not nearly sweet enough. This coming from someone who hasn’t eaten refined sugar for years and rarely makes any kind of sweets. Next time I’d try 1/2 cup maple syrup. I didn’t have chocolate so added peanuts instead. First time making a vegan dessert! Won’t be my last now :) Satisfied my chocolate craving! I was looking for a way-less-sugar no-bake cookie recipe, and these are fantastic. I used almond butter in place of the peanut butter, and added coconut flakes. They are perfectly fudgy right out of the fridge. Looking forward to trying with other nut butter varieties, too! Have made these at least 5 times. Non-vegan family loves them too. Only problem I had was one time the chocolate wasn’t melting enough, I think because I added the oats first so now I add the chocolate first, then peanut butter and oats. Yummy! Could you substitute the maple syrup for golden syrup? Yes, that should work, though we haven’t tried and can’t say for sure. Let us know how you make out, Matt! My family loved these! This was a great easy recipe. These are SO good. Followed everything to the T and consistency and flavor are perfect. Thank you! Curious if I could make these, let them harden overnight in fridge or freezer, mail to daughter in college? She’s a vegan and exam time, etc. I would wrap them up well but obviously they would thaw in transit. These are super easy and delicious—really rich, as someone else mentioned, but great! I used vegan butter and pulsed the oats into a chunky “flour” as I don’t love chomping on whole raw oats. My three year old and husband will probably polish them off in a couple hours :) Thanks for another excellent recipe! These are really good. Whenever I try anything from any site I always swap out the sweetner for swerve 1st time around. If it doesn’t turn out, but I really want to try the recipe, I repeat the recipe as written. I really didn’t expect these to be as good as they were, considering, but I really, really like them. Thanks Dana! I’ll be making these a lot. I always have something of yours in my freezer. Right now are chocolates and energy bars. These are a wecome addition! I’ve made these twice in the past two weeks. The first time I made them, I followed the recipe exactly except I used coconut milk because it’s what I had available. The result was perfect. Today, I ran out of coconut oil and only had 2T instead of the 3 the recipe calls for, so I put 3T of coconut milk instead of just 2. They actually came out creamier and a bit gooier! I prefer the 2nd time around, with less oil and more milk, so I’ll keep that adjustment from now on. Thank you for the awesome recipe! Smart! Thanks for sharing, Melissa! I am not sure what I did wrong. The mixture is very runny and won’t be scooped. I ended up pouring in a pan and cutting into squares when cool. This amazing treat was a hit at my house! It definitely fulfills that Chocolate craving that we get from time to time. I love your simply recipes. I have made several of them. Thanks for sharing your recipes. I am definitely a fan! These are delish! I used a mix of honey/maple syrup and 1/4 cup chocolate chips but I might leave them out next time cause they are so good without! My only problem is that I ate too much batter! These no-bake peanut butter chocolate cookies are delicious! I have made them 3 times, the first 2 times as written (except with boxed coconut milk, instead of almond milk, as that is what I had), and the 3rd time using unsweetened coconut flakes instead of oats. I would not hesitate to make these for a potluck, or a tea party, or picnic, or to freeze for a quick snack if company pops over. The first 2 batches I gave as gifts, and they were well received. I haven’t made these yet, but I want to soon! I was wondering if I could swap avocado oil for the coconut oil? I don’t have any coconut oil at the moment. Thanks! I don’t know if that would work, as the coconut oil helps these stay firm because coconut oil hardens when refrigerated. I do not know if avocado oil would also harden if refrigerated. You could try it though, and freeze them, instead of just refrigerate. So delicious! I’ve been keeping these on hand for a few weeks now- they’re my go-to treat to satisfy my bedtime sweet tooth without the guilt. I’ve found they’re extra yummy with fresh- ground, semi-chunky peanut butter. So rich, easy, and delicious! Peanut butter and chocolate is my absolute favorite combo <3 Thank you! These are amazing! My friend introduced me to your site and I’m in love! So many different recipes to suit my healthy lifestyle, but also helping me deal with my current GI/Immunity issues (fresh off Whole30). Anyway, back to these scrumptious morsels! I made a boo boo and put the dark chocolate chips in too soon, but they still turned out fabulous! Made a double batch! Thanks for sharing, Bridget! Glad you enjoyed these! Welcome to the MB community! These are just fantastic! I used Belgian chocolate bark for the chocolate and almond butter. I already ate 3 and have not shared them yet! Thank you once again Dana! Yay! We’re so glad you love them, Mary! I loved these! Only thing is 120 calories each accordingvto MyNetDiary after I entered the recipe! But I look at it this way, it’s motivation to do higher miles in my Leslie Sansone HIIT training workouts! ? I will just have to burn an extra 240 calories do I can have two with a tea because these ARE worth it! Thank you Minimalistbaker for all you do!! Love your recipes and buy your books to support you! ? lol – glad you enjoyed these, Gabby! These look so yummy! I am going to try them with cocoa nibs though as I am sugar free or maybe additional nut butter? Wish me luck! Report back on how it goes, Carly! I’ve made these twice now! Soaking the oats makes them even fudgier, which I love. Speaking of, these remind me of a cookie my mom used to talk about eating in her school cafeteria (back when they still served actual food) called fudgies that were super simple and no-bake. I wonder if anyone has tried something like these without the chocolate (!) — like just a pure peanut butter version. Wonder if this recipe would work just leaving out the cacao/cocoa powder and chocolate. Ooh smart! thanks for sharing! If you give the non-chocolate version a try, let us know! These are as sdvertised. Yummy. Mine turned out super rich. I subbed sunflower seed butter. Glad you enjoyed them, Heather! I tried making these yesterday. My first minimalist baker recipe. I’m hooked! They were so easy to make and they taste soooo good. Definitely going to try the freezing a batch for pulling out as a treat. Thanks for a brilliant recipe. Quick, easy and so good! I used vegan chocolate chips and they turned out great. Whoop! Glad to hear it, Jill! These were amazing. I rolled them in Hemp seeds after they hardened. They are a huge hit with everybody! I also used chunky peanut butter and added unsweetened flaked coconut. Thank you for this one. Great idea, Beverly! We’re so glad you enjoyed them! These were great they are rich and have a great flavor. They are kinda like fudge with oats mixed in. I let mine cool for about 25 minutes instead of 15 in the fridge. I will definitely make these again. Glad to hear you enjoyed them, Addi! yummmmmmm!! i’m a sucker for all things peanut butter and chocolate and these are now on my top 5 list. aaaaand another 5 star. Whoop! Glad to hear you enjoyed it, Sarah! I made these with the leftover “meal” from making homemade coconut milk instead of oats, so that they’d be grain-free / paleo-esque, and they are absolutely DIVINE. This is from a person who has deeply enjoyed dairy and grains for many years and has a natural suspicion of vegan desserts from too many really dry yucky ones at potlucks in the past. I used cocao nibs instead of the dairy-free dark chocolate and crunchy peanut butter, so they have a nice chippy-crunch to them, and topped them with a dusting of coconut sugar for contrast. They’re so yummy that I’m hiding them from my husband and child. No one needs to know that my new diet is so delish. Would almond butter work as well do you think? I made these last night and they are so wonderful. I was out of maple syrup so I subbed 1/4 c. of coconut sugar as someone else had mentioned in the comments and added one extra tablespoon of almond milk to account for the loss of liquid. They turned out perfectly! So fudgy and delicious. I have some arthritis do peanuts are off the table. Almond butter worked just fine. Will try a seed butter next. Delicious. Just made these tonight and wow!!! SO. DAMN. GOOD! My kids (ages 7,6, and 2) are in love with them, as am I :) And so simple to make as well. These are going to be a regular in our household! ??? Yay! Glad to hear it, Dave! Love these! 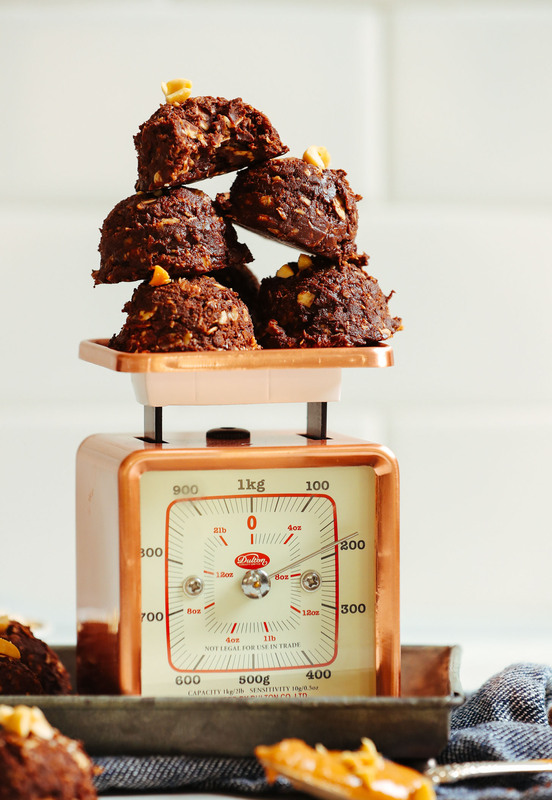 I’ve been looking for a refined sugar free version of no bakes and LOVE this!! I was planning on no bake cookies for the weekend and did not have a dairy free recipe and boom!, this recipe was in my in box! Yes I made them and yes they’re GREAT! Hi Dana! These cuties look like the perfect morsels to take on my weekend camping trip. I’m wondering if they will hold up well enough outside the house hold refrigerator? As in do you think packaged snuggly inside a portable cooler would be okay? Looking forward to enjoying these by the campfire! They do! They’re best in the fridge for storage, but they can be taken along for the ride outside. Good luck! I love anything peanut butter, so made these right away. Sooo delicious. Going to top them with flaked sea salt next time. Sea salt would be a delicious addition, Pam! The vegan cookies look amazing. I tried to make it and it tasted amazing. Even the kids love it. Made these tonight and they’re delicious! Totally remind me of my childhood. Though if you don’t have a sweet tooth, I recommend cutting the maple syrup a bit. I used the full 1/4 cup but then I only used 1/4 cup of 70% dark chocolate and 1/4 raw cacao, and the cookies are still a bit too sweet for my preference. I made these tonight, so incredibly good! I forgot to buy almond milk, so I broke into the full fat coconut milk I had for a different recipe of yours. It worked out fine, it seems, and my 12 year old is very happy tonight. This is a summer keeper, though hard to eat just one. Great! Glad you enjoyed, Monica! These are delicious- I just made them with almond butter instead of peanut butter, without adding extra chopped chocolate. Thanks for a quick and easy recipe! I made these again! I love them!! This time I added 1/2c peanut butter, and it tastes delicious! Again, as a note to others, I don’t add the dark chocolate. Thank you Dana for such a delicious recipe! I just finished making this . They aren’t quite cooled off yet but there was a tiny bit left that I tasted. Really very good! I made these for my husband so I didn’t put coconut in, I was going to put extra peanuts in but wouldn’t you know it they are all gone. They aren’t quite as pretty without a little something sprinkled on top but still very tasty . I was going to post a picture but couldn’t figure out where to add it. My daughter and I just made these this afternoon. So yummy!! We put coconut on top, but next time I’m putting flaked sea salt on top. I made these using coconut butter instead of oil and no chopped chocolate and they are delicious! I’m out of maple so I subbed that with 1/4 cup coconut sugar and 2 more tbsp plant milk. Because unlike oil coconut butter can burn, I didn’t let it boil. Also make sure you stir constantly. I bet they would be even more tasty with the chocolate, I will try that another time to make them more dessert like. As is, I had them for breakfast! These cookies are amazing!! They are so easy to make and taste decadent!! From tasting the batter, I felt like I didn’t even need to add the extra dark chocolate but did I sprinkle in a few dark chocolate chips, just because. I love your website…thanks so much for sharing it with us!! Glad you enjoyed them, Stacia! Delicious. I did make a few changes. Left out coconut oil and maple syrup, substituting the same quantity of almond milk for coconut oil and threw in about 4-5 tablespoons of raisins for some natural sweetness. To compensate for the lack of melted fat and syrup, I warmed the chocolate with the almond milk and peanut butter, then took it off the heat and stirred until the chocolate melted and peanut butter softened and used this to bind the oats. Also left out the cocoa powder as I wasn’t adding additional sweetening. They were chewy and cookie like and didn’t suffer for lack of added fat and sweetener. I made them into little balls with oiled hands. I will definitely be making variations of them again with different nuts, dried fruit and flavourings. Thanks for sharing your recipe changes, Krishna! We are glad you enjoyed them! I made all of my oats into oat flour. Do you think I can use it instead? The oil is what helps them set up more firmly. Maybe try more peanut butter or add some brown rice syrup? Hmm I’m not sure that would work as well, Darlene! If you do give it a try though, report back. Good luck! What can I do in place of coconut oil or vegan butter? Trying to do oil free. Yum! I used vegan chocolate chips which melted into fudgy goodness. My husband mentioned that he may like coconut added but said they were his favourite no bake cookie yet! So yummy, thanks for the recipe! First batch is all in our bellies so will make another batch and try to freeze some next time! Yum, I just made them and they’re awesome! I left out vanilla since I’m allergic, and also used chocolate almond milk and Demerara sugar I stress of maple syrup. Thank you; I love your site! Can I use agave instead of maple syrup? I am allergic to oats. Do you have any suggestions for what I can use instead? Flaked coconut, almond flour, or crushed nuts? Raw sunflower seeds could probably also work. Just made these and they came out beautifully, getting the solid 15 as specified. They are quite rich, but totally yummy! One satisfied my chocolate craving. For those commenters who aren’t keen on raw oats, I’m not particularly either, but instead of large flake, I used organic rolled oats – I find them a little more palatable when using them raw. I was also thinking as I was making the chocolate sauce…how good would that stuff be on some ice cream? Or drizzled over crepes? Thanks Dana – another winner! Made these last night and they are soooo good! Super rich and delicious! Thanks for this delicious recipe and all the others! Eating evolved chocolate is bomb! I love making peanut butter cookies with crunchy PB ?? it adds a cool texture and tell peanut chunks! Cheers! I don’t eat any grains, so apart from using coconut in lieu, what else could I use? Hmm, nut meals, such as walnut or almond? Very chocolate-y (without the dark chocolate), yet of course still delicious! Doesn’t harden as well as the popular cookie recipe, but at least it’s healthier than that version, so it’s ok! I’d add more peanut butter next time. These harden perfectly, I was just impatient with the first few! Pretty much the same as the coconut no bake cookies? Are these an improved version? These sound like they could be good. However, I don’t like raw oats. I’d leave them out or maybe use coconut. Hi there, I made these using rolled oats and posted a comment. But your comment got me thinking…so just now, I went into the house and tried adding some crushed heritage flakes (a sort of healthy non-corn version of corn flakes) to them. Or, I would also suspect that you could add brown rice crisp cereal, both of which add a nice crunch as well. Don’t know for sure if they would still hold together as “drop cookies”, but if not, you could squeeze everything together and make balls (which I did). Those are great alternatives. I especially like the crisped rice cereal option. I think I will try these out on my peanut butter loving husband who is also highly suspicious of anything vegan! I am vegan so try to slip in a few things to get him onboard!